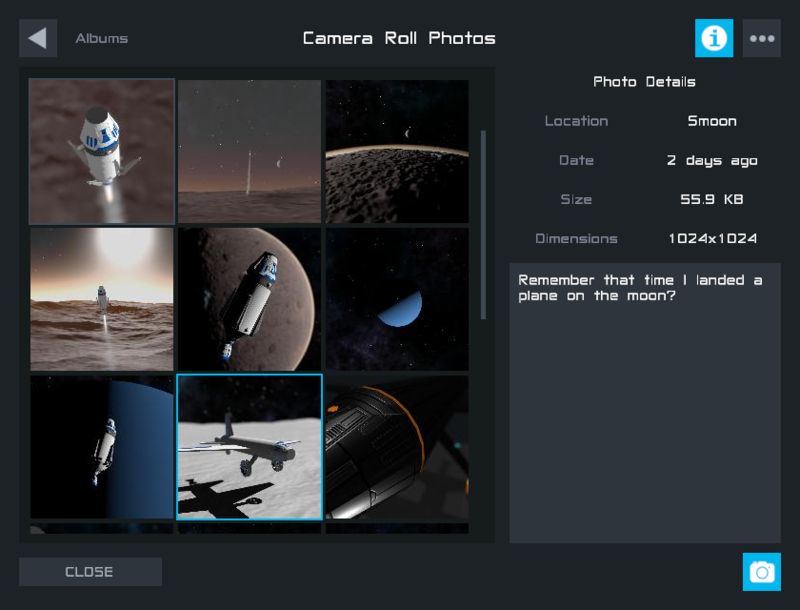 This past week I finished adding a new Photo Library feature to SR2. This makes it easy for players to take screenshots of their crafts at any time (in the designer or in flight) and use those screenshots when uploading their crafts and sandboxes. It also keeps track of when and where you took the photo and you can write a description if you're a fan of keeping journals of your craft's journey across the solar system. I've also taken some time to improve the screenshot tool. Now you can switch between landscape, portrait, and square orientations. You can also enable a depth of field effect so that you can snap nice looking photos of your craft like you're using a big expensive camera. You can drag the focus point around to focus on specific parts of your craft. I'm really excited about this feature. It was a lot of fun to work on and I think it will make it easier for players to showcase their content in the best way possible. Will this be added in SP? What happed to the weekly updates? The game is looking really cool. Do you know when it’s going to come out? I hope this game would be amazing. Oml, I'm making a scale replica of the Arrma Senton then, it will look amazing. I just spent about 24 days testing my trip to Ares IV! What a trip. I'm about 100 meters from the Hab. I'll log back on after I get home. @GR00G0 pretty sure they're procedurally generating a heightmap, as I think was mentioned previously. And I think it's more advanced than just simplex noise. Still no official release date? @matkag5 yeah but i wonder if they generate craters with heightmaps or simplex noise. @AndrewGarrison Will there be mods for android? @AndrewGarrison that's fine, I'm hyped anyways!